Your bed is your haven. It is the one place that when you retreat to, you should have the highest level of comfort ever. You should be able to enjoy quality time and good night sleep. If you aren’t, then, believe it or not, you aren’t having the right best for you. In short, it is time you sat back, and actually re-considered the size and the type of bed that you are using. And if you didn’t know; a pretty simple change on your bed can leave you with unbelievable comfort. In this post, we have chosen to help by giving the most important facts about every bed-size that you will find in the modern markets today. The conventional king size bed dimensions measure 76 inches in width by 80 inches in length. However, the California king size bed also known as the Cali-King measures 72 inches in width by 84 inches in length. The King can be said to comprise of two “twin-size beds” on a single bed frame. King Size: Best for people who share their bed with their spouse, pets, and kids. They are also best for people who have found the queen size bed dimension lacking in space. Cali King: If you are the taller guy who has always had their feet or toe hanging out of the mattress Cali King gives you the leverage of the extra inches needed. Typically, any Queen-size bed will measure 80 inches long by 60 inches wide. However, there are two exceptions here too. We have the Olympic Queen-Size that will measure 66 inches wide by 80 inches long, and the Cali Queen (California Queen) which measures 60 inches wide by 84 inches long. The Olympic and Cali Queen are however difficult to find which makes finding their covers, toppers, and linens a little more difficult too. The queen has its accessories readily available. Plus they offer the good remedy of space – more specifically for couples who don’t share their beds with pets or kids. If you are new to beds, you may get really confused about what a full-bed is. Also known as the double bed, full-size bed dimensions sit at 54 inches wide by 75 inches long. Their design is generally a traditional design that most couples used before the king and the queen size bed dimensions existed. Even so, you can still get a full-size bed if you have a teen who is a pre-teen or one who is shorter than 65 inches. This mattress is best for people who require the best compromise between the twin and queen mattresses. A teenager who can no longer use their childhood beds will be best suited to this additional space. Other quarters also suggest that people who are just starting out on smaller apartments such as college graduates will find this bed quite befitting and economical investment for their small room always. The other great bed size dimensions are the twin size beds. These beds are also referred to as the standard twin beds and come with standard bed height. Some people also call them singles. Twin size beds will hold mattresses that are 39 inches wide by 75 inches long while Twin XL will make do with 39 x 80 inches. However, there are a few instances that you may bump of an on extra-long twin size mattress. These ones are usually 5 inches longer than the normal twin. Apart from working quite well with small children, twin size bed dimensions will easily accommodate adults too. Here are a few areas that you can use a single bed. Twin: Also known as single are slim. This makes them easy to stack side by side in larger beds or bunked up. Twin XL: Ideal for parents who need their growing kids to have a better space to stretch out. The extra inches added to the versatility. The toddler bed will hold a mattress that’s of the same size as the crib mattresses. They often stand at 27 inches in width by 52 inches in length. Thanks to the bed’s small sizes that makes waterproofing an easy take, most of these beds are usually watertight and you don’t have to worry about your baby wetting the bed. Nonetheless, you should still train your kid to use the potty. Crib mattresses are also firmer than the adult mattresses. Their weights differ and the lighter ones are super portable. We also have the Bunk Beds. These ones come in customized designs that allow you to have a double bed in a single space. It can come as a twin-over-full size or in twin-over-twin design. For people with a number of kids or a huge household, bunk beds will provide the perfect sleeping arrangement. In most cases, the standard weight limit that most bunk beds have is 165 lbs. Even so, you don’t have to stick to that if the manufacturer’s guidelines state otherwise. Read the user manual to find out limits. We also have the Trundle Bed. These are also called the under-beds. They are often low and highly collapsible. You can store them so easily under an existing Queen Size of Twin Size bed and only roll them out when you need them. Trundle Beds are actually the “air mattress” of beds. So easy to work with and super perfect for the unexpected guests. Note: The Trundle bed and the Bunk Bed will use the standard bed height. At its typical size of 38” W x 75” L, this mattress is virtually the smallest of all the adult size mattresses. It would, therefore, be very suitable also for kids who have outgrown toddler beds. Who Needs Which Bed Sizes? Here is a simple breakdown of the type of bed that you will need for your household. It will help you to make a great choice. Depending on their age and stature, your kids will most probably be very comfortable on these beds. If you have just finished college, moved in alone, or are yet to get married, you will likely get comfy on the following beds. In case you are married or are staying with a partner/ roommate is a house with limited space that you have to share a bed, the following beds will be the best. Finally, for adults with pets or kids and who share their bed routinely with either of the two, this bed will be your best bet. When considering your choice of bed sizes, these factors will easily allow you to narrow down to the best size half the time. If you are using your bed alone, twin size bed dimensions will just be okay – unless you want more space. However, if you are planning on sharing your bed with a spouse you may consider going for a larger size such as the Cali-King or the queen bed. More space will also be required by people who are huge and those who also share their beds with children or even pets too. So take your time to determine if you are going to share your bed or not. The fact of whether you are on the shorter side or the taller side will also play a critical role when you decide to drag a new bed for your home, and I guess the mattress size chart says it all. 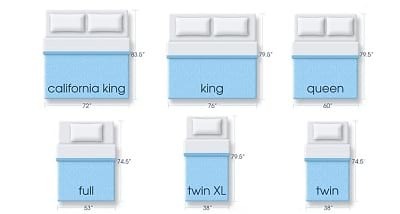 Just like you may have noticed, you will realize that the Cali king size bed dimensions measure a few inches extra on top of the traditional king. This small difference as it may look plays a huge role when it comes to tall or short stature. If you are the taller guy, the Cali will be a great shot. Nonetheless, shorter guys will find the traditional king or the normal twin size super ideal. So make sure you have a clue of where you fall before you chose to spend money. So how large is your bedroom? Whatever the size, I believe you will find a great width of bed that fits in your bedroom. However, it will be very important that you measure and record the dimensions of your bedroom before you go on a shopping spree. This will not only give you an idea of the exact space that you have but it will also allow you to get the perfect fit bed especial; y if you don’t have the freedom of space. Depending on the amount of money that you are planning on spending you will be easily restricted to buying a bed within your range of comfort. If you can comfortably spend your money on the bed, it means you are finding the bed to be extremely affordable. And this is a key factor when it comes to an ideal purchase. How much room would you like for yourself? And how many pillows do you love to have? Well, both are important. If you use many pillows and still would love much room to move around on, going for king bed dimensions would be awesome! Do own a mattress already? In case you do, and unless you want to have an extreme makeover for your home, you may just need to find a bed that your mattress will fit in. This should take a shorter time as you already have the mattress sizes which should help to determine the bed’s dimensions easily. What is the difference between the single mattress and a twin mattress? None! These two mattresses are actually the same. These two words (single and twin) are used interchangeably to actually term the very same twin-size mattresses. In the US, the basic term used is the “twin” and refers to the width of bed that measures 38 inches wide by 75 inches long. The term “single” is used in the other parts of the globe for mattresses with the exact dimensions. What are the most popular bed sizes? The most popular bed size come with easy to find accessories. 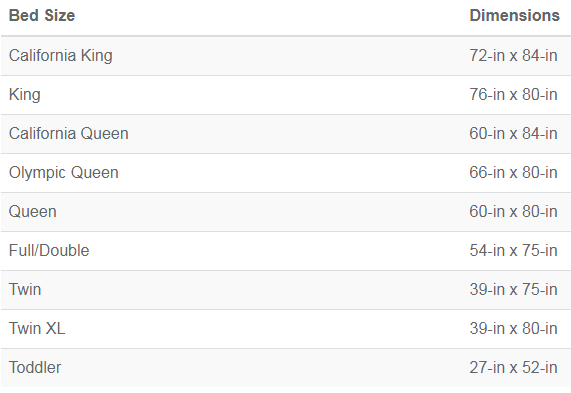 This means the Queen is ideally popular of them all. The reason for this is simple. Many people find the queen size bed to have enough space for two guys. It, therefore, makes it really easy to sleep on. It is easy to move in and out of narrow doorways and tight staircases. More importantly, its standard mattress thickness strikes the middle ground when it comes to size, budget, and price compared to the Kings. Is the full-size bed exactly the same with the double bed? Absolutely! Full-size beds are sometimes called double beds. The two terms actually denote the same thing. Double or full-size mattress measures 54 inches wide by 75 inches long. Don’t make a direct comparison of the double bed to mean two of the “single beds.”That’s never the case. Actually, full-size bed dimensions are usually 15 inches wider than the single or the twin size bed dimensions. The two beds/ mattresses, however, share the exact same length. And just like (single and twin) the (double and full) can also be used interchangeably. However “double” was used a lot by the older mattress manufacturers. What are the differences when describing bed sizes versus mattress sizes? There is NONE that we can point out to. And this is one vital factor that many people should understand. Like the few terms that we have seen above, the term “bed-sizes” and “mattress-sizes” can also be used interchangeably. However, what many people must realize is that the term “bed” can often be used to refer to a set but not necessarily one mattress. The same term could also mean your standard mattress thickness, mattress sizes, and box-spring, or bed frame. What about Texas or super king mattresses? Over the years there are quite a number of “specialty” mattresses that have been created. However they are not sold as much as the models that we have round up here; therefore because of their rarity, such width of bed can be very difficult to find and also may pose challenges with their type of beddings. That’s the class that Texas and Super-King Mattresses fall in. From “two” side-by-side twin beds what bed size will you make? The 38 inches width by 75 inches length twin bed, when combined with another one in a side by side design, will provide close to the same amount as the king size bed. Two “Twin XL” on the other side, also placed in the same design will also provide almost the same size of space that a Cali-king bed dimension will provide. This should be a measurement of about 76 inches by 80 inches. Due to this high style compatibility, most mattress manufacturers have resorted to supporting the two Kings with two side-by-side twin XL or twin box-springs to allow their customers the ease of dragging out huge mattresses with standard bed heights around the house. Can full-size bed dimensions be used comfortably with two people? Using a full-size mattress with two people will depend. Typically if you divide a full mattress in to exact two sizes you will have a space of 27 inches on either side. This is an equivalent of the width of the crib. This means that if you can make do with such a space; then why not? You can grab this mattress and enjoy its standard mattress thickness. It is, however, advisable that you and your partner test the mattress first before you choose to make any purchase. For the shorter guys, this should work fine. However, we do not recommend such a choice for taller guys as you will have a shorter and quite uncomfortable bed. What are the largest bed sizes available? For most, the king bed dimensions are the King. But that’s not true. Actually, the Alaskan King, with a whopping 108” x 108” measurement is the King of space. A onetime buy will give you and your partner the best transfer of motion and an opulent 54” of space to enjoy every time you hit the sack! So if you’ve got enough space in your master bedroom to get rid of the Traditional King, your best shot for a replacement will be the Alaska King! Choosing the best bed sizes to go with is never easy, considering the collection of mattresses that the market has today. With just a single step on an online bed selling site, you will find King, queen size bed, Full XL, Double, and the widely sold Twin XL beds. And such an array of a display can easily throw you off balance really. That’s why it’s very important that before you end up with the wrong bed, understanding the specific bed dimensions will really help you in narrowing down to the best bed size dimensions and mattress size to go with. Use the bed size chart or the mattress size chart to get started pretty fast and easily.